Note This topic applies to both API Gateway and API Gateway Analytics. Role-Based Access Control (RBAC) enables you to restrict system access to authorized users based on their assigned roles. 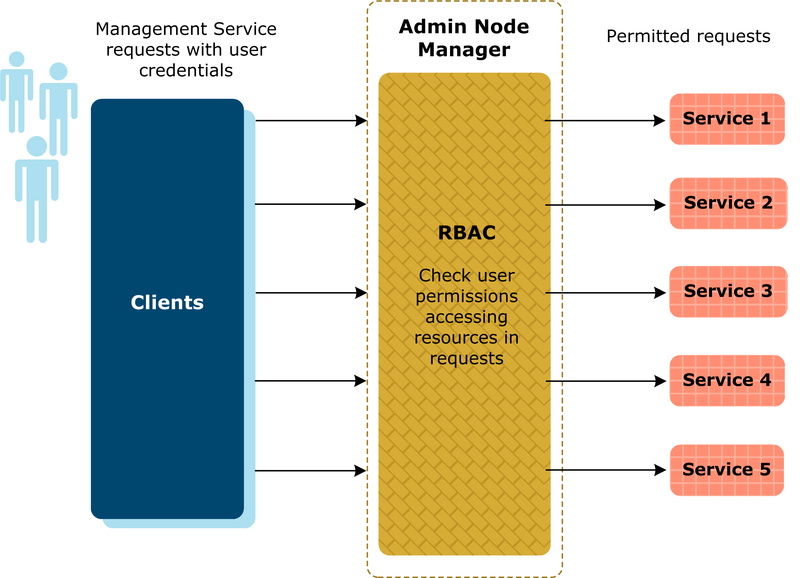 Using the RBAC model, permissions to perform specific system operations are assigned to specific roles, and system users are granted permission to perform specific operations only through their assigned roles. This simplifies system administration because users do not need to be assigned permissions directly, and instead acquire them through their assigned roles. The web-based API Gateway Manager tool (https://localhost:8090) is a centralized dashboard for managing and monitoring the API Gateway, and is controlled by RBAC. Users connecting to this URL with different roles results in different features being displayed. For example, users with the API Server Administrator role has read/write access in the API Gateway Manager tool. However, users in the API Server Operator have only read access in the API Gateway Manager tool. For more details on the tools and privileges assigned to specific user roles, see Manage admin users. Traffic Monitoring Service API Gateway Manager Displays HTTP, HTTPS, JMS, and FTP message traffic processed by the API Gateway. Configuration Service API Gateway Manager Adds and removes tags on the API Gateway. Topology API API Gateway Manager Accesses and configures API Gateway domains. Static Content Resources API Gateway Manager Manages UI elements in a browser. Deployment API Policy Studio Deploys configurations to the API Gateway. KPS Service Policy Studio Manages a Key Property Store. For full details on the default roles that have access to each Management Service, see Management service roles and permissions. INSTALL_DIR is the directory where the API Gateway is installed as Admin Node Manager. The credentials from this file are used to authenticate and perform RBAC on all accesses to the management services. This store holds the user credentials, so their passwords can be verified, and also holds their roles. Credentials and associated roles can also be retrieved from an LDAP Directory Server (for example, Microsoft Active Directory or OpenLDAP). Admin user passwords are in stored in the adminUsers.json file as a base64-encoded salted hash of the plaintext password. To authenticate a user password, the incoming password value is digested in the same way, and compared against the value in the file. If they match, the user is authenticated. The default admin user is assigned the API Server Administrator , KPS Administrator , and Policy Developer roles by default, which together allow access to everything. For full details on the management services that each role has access to, and the permissions that must be listed in the acl.json file to have access to them, see Management service roles and permissions. Note The roles defined in the acl.json file should exist in the user store used to authenticate the users and load their roles and groups. The default roles are defined in the local Admin User store, which is used to control access to the management services using the Protect Management Interfaces policy. If a different user store is used (for example, an LDAP repository), the LDAP groups should be listed in the acl.json and adminUsers.json files. The permissions line is repeated for each permission the role has. To determine which permissions should be listed for each Management Service, see Management service roles and permissions. You can place a wildcard (* ) at the end of the path field. For example, see the path for dojo resources in the example that follows. This means the role has access to all URIs that start with the URI content that precedes the *. In some cases, you must protect a Management Service by specifying a query string after the URI. Exact matches only are supported for query strings. When you click Create to create a new user, you can select the roles to assignto the that new user. New users are not assigned a default role. While users that are replicated from an LDAP repository do not require a role to be assigned to them. You can click Edit to changed the roles assigned to a selected user. When you add a new role to the Admin User store, you must modify the available roles in the adminUsers.json and acl.json files in the conf directory of your Admin Node Manager installation. You must add the new role to the roles section of the acl.json file, which lists all the permissions that the new role may have. Note You must update the acl.json before you add the roles to the Admin User store. The RBAC policy object automatically reloads the acl.json file each time you add or remove a role in the Policy Studio. When you update the acl.json file, you must restart the Admin Node Manager to reload the acl.json file. However, the Admin Node Manager does not need to be rebooted or refreshed if a user’s roles change. For more details on managing user roles, see Manage admin users. You can use the following table for reference purposes when making changes to the acl.json file. It defines each Management Service, and the default roles that have access to them. It also lists the permissions that must be listed in the acl.json file to have access to the Management Service.